the photographer, Erik Tønnesen for permission to edit this article. For English readers, a few notes are added on the bottom. 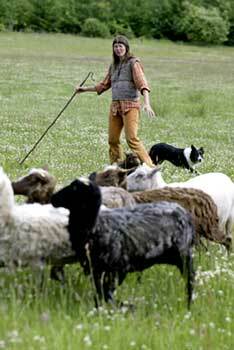 Spaelsau is an ancient nordic sheep race. You can learn more about it at the visitation centre “Lystbaekgaard”, located by the small town of Ulfborg. In the western part of Jutland near Ulfborg, a flock of an ancient nordic sheep race is grazing the fields. In the Bronze Age the same race provided wool for clothing, and some 2000 years later, the wool was used for the big sails on the Viking ships. A reconstruction can be seen at “The Viking Ship Museum”, located by Roskilde. The race is called spaelsau (spælsau), and the country of origin is Norway, but from archaeological textile findings, we have learned, that the race came to Denmark in the Bronze Age. Furthermore the race spread out to the rest of Scandinavia and the North Atlantic Islands. The spaelsau has a very distinctive type of wool, and that is why we are able to trace it back thousands of years. The wool is double-coated. The outer layer protects against rain and wind, and the inner layer of soft wool keeps the sheep warm. The wool is essential for the race, being able to manage on their own on some wind swept island in the North Atlantic Ocean. This also explains why the Vikings were able to make sails.The double-coated wool was the basis for making sails. If the sails were able to soak up water the boats would inevitably capsize. The sheep at “Lystbaekgaard” belongs to Berit Kiilerich, who was trained to be a shepherd in Scotland and England. Three years ago, she purchased the farm “Lystbaeksgaard”, which is located between Ulfborg and the village Torsted. At the time most of the property was in poor shape, but is now restored (costs are partially covered by EU-fundings). The farm is now a visitation centre concerning sheep, wool and old trades. The centre is open for visitors from the middle of april until the end of october and also during Christmas and special arrangements. A local association is helping at different activities, but the main attractions are the sheep and Berit, with her amazing sheep dogs. Even though Berit has both spaelsau and jyske hedefår (another ancient race, with origin in the northern part of Germany), it is the spaelsau, which is her passion. The wool is lustrous, with great variation in colour, ranging from white to red, and very dark blue. These qualities offer excellent fleeces and the outer and inner wool has a wide range for usage, such as waterproof clothing. Berit and other spaelsau enthusiasts will promise, that the meat has a great taste. To unite and promote the same interests a spaelsau-society was formed in the spring. One of the purposes is to make a sheep-breeding register, to locate existing genes and help the exchange of genes. Another possibility is, for the members, to have the wool and fleeces processed in the right manner. As of today it is uncertain, just how many spaelsau there are in Denmark, but probably close to 1000. To do things right the wool of spælsau is to be plucked not sheared. During the time the sheep shed their wool, it can be picked in large lumps, which gives a better quality of the final product. If the wool is sheared opposed to being plucked, the fiber of the hair is open in both ends, which causes it to be weaker and less water resistant. Carding the Spaelsau-wool will also destroy the fibres, but instead the wool is pulled to a long string before being spun as worsted. The strong outer wool is used for weaving. The sheep has good maternal instinct and are very fertile. The Spaelsau belongs to the Northern Short-tailed Sheep Group. Within this group, a few breeds have still kept their landrace characteristics. One of the best excamples is the remarkable Norwegian Villsau, a close relative to spaelsau. There has been found about 700 ewes in Norway, according to the landrace-standards, set up by the Nordic Gene Bank, Animals. It is expected, that there will be around 3-400 ewes of landrace in Denmark. As appearing from the photos in this article, the flock of Berit Kiilrich has kept its landrace characteristics.